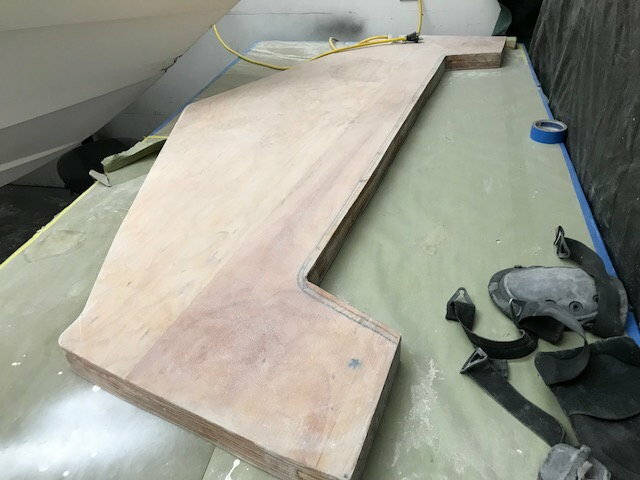 Does anyone know what wood was used by the Pantera team in the 2 inch thick 24SE transom. It seems to be made up of 7/16" glass external about 1.5" of wood and an internal covering of about 1/4" glass. My transom wood is pretty wet caused by a seal failure of the gimbal housing - it doesnt seem to be like a birch marine ply? My 1994 transom was made of 2 layers of the finest 3/4” hechinger (think 80s Home Depot/menards) plywood. Not marine and not even bed with any glass to the transom. You could see some type of adhesive where they glued it to the transom with no mat between. Tons of layers of glass both inside and out but not much between. Most came out in a big chunk once we cut the inner skin out. Is it best to put in a good Marine ply? It seems fairly easy to get out with a multi-tool cutter? Yes. There’s plenty of threads if you search through here. But yes marine ply is the only wood you should put in a boat although not many are made from it unfortunately, no matter the brand. People use various tools to remove it. Mainly just dirty labor intensive work. Multi tool, grinder, sawzall, circular saw, whatever it takes lol. Prepwork is key to a good finished product. 2. the worse the transom is the easier the job. 3. a nice trick for getting the wood out... take a skill saw, set the depth with a little bit of safety margin to the depth /thickness of the wood, then crosscut, score the heck out of it, then a good wide chisel and that should get most of it. 4. for the rest, a 4" harbor frieght angle grinder with a 36 grit flap disc will knock out the rest. 5. Since you arent really used to fiberglass, your likely to end up with the itchy scratchies....Get a couple cheap tyvek suits from home depot, double glove and tape the wrists, get a decent dust mask.filter, not the 99 cent paper one. douche anything left exposed heavily with baby powder, good dustproof goggles. when your done blow yourself off with an air nozzle if you have one, then take a COLD shower. 7. Dont get greedy.... make too pig of a batch of resin, try to put too many layers on at once. 10. if your worried about the finish appearance, get some peelply and roll that down good after your last layer, after its dried, pull it off and it will have a much nicer finish. I am restoring a 1987 Banana and re-did the transom. photos on the Banana thread. take the old one out and redo the entire back end.